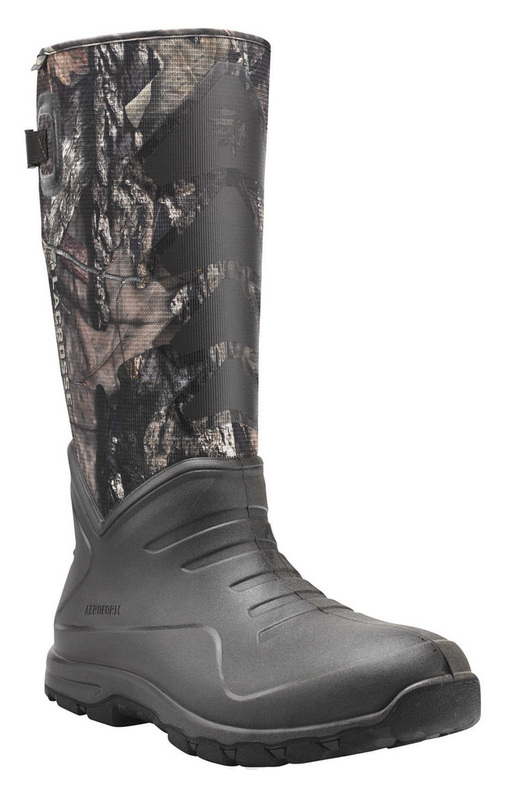 Combining comfort with excellent snake bite protection, this boot features flexible Snake Guard material and patented AeroForm® technology that ensures durability. This waterproof boot incorporates molded polyurethane over a neoprene core, and the thick midsole provides best-in-class cushioning. The all-season outsole’s non-loading tread can tackle all types of terrain, and the oversized shank covers the entire arch area for added stability. The polyurethane-reinforced shin and Brush Tuff bi-directional material offer abrasion resistance. A quick-drying polyester jersey liner wicks away moisture. In addition to the Active Fit design with an adjustable neoprene gusset, the boot features a molded kick-off heel plate for hands-free removal. Mossy Oak® Break-Up Country™ pattern. The boot is 16" tall.